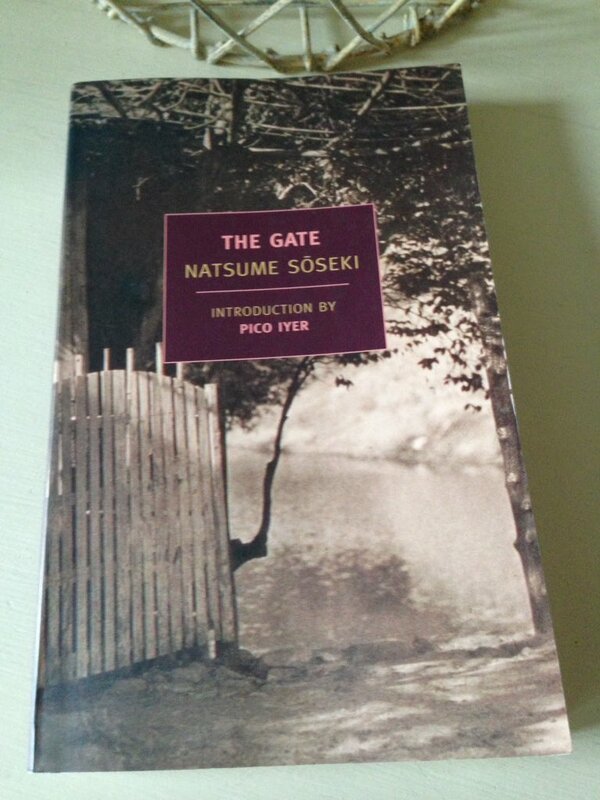 There is something very compelling about Natsume Söseki’s The Gate, the sort of quiet, contemplative novel I find myself increasingly drawn to these days. At first sight, it may seem a relatively uneventful tale of an ordinary Japanese couple trying to get by from one day to the next. Nevertheless, in reality, everything is happening here; we just have to tune in to the author’s style in order to see it. First published in Japan in 1910, The Gate revolves around the lives of Sösuke, a lowly clerk in the Japanese civil service, and his wife of six years, Oyone. As the novel opens, Sösuke is relaxing on the veranda of his home in Tokyo; it is Sunday, his one day of rest. Before long Sösuke sets out for a walk on his own, and in the process of this excursion, we learn a little more about his situation, in particular his mindset and outlook on life. It soon becomes clear that the monotonous routine of life as a commuter has left Sösuke mentally paralysed and physically drained. As he strolls around the city, it is as if he has never really noticed his surroundings before. In time, the gaiety and sense of ease he notices in those around him only serve to highlight the dreariness of his existence, and as the afternoon draws to close he is reminded of the inevitable stresses of the week ahead. From the opening pages of the novel, there is a sense of detachment about Sösuke, as if he is merely existing in the world rather than participating in it. As the story unfolds, we start to hear a little more about his backstory and the reasons behind his current demeanour. Although Sösuke and Oyone are still very young (late twenties, I think), they seem stuck in a form of stasis that one usually associates with middle age. Once a quick-witted and lively young man, Sösuke now seems to have accepted his lot in life. In time we learn that some years earlier Sösuke was forced to abandon his studies at university following a scandal that had emerged at the time, a sequence of events that ultimately resulted in strained relations with his family. There is a darkness in Sösuke and Oyone’s shared past, something shameful that seems to have haunted their lives ever since. Moreover, the novel raises the idea that fate may be punishing this couple for their previous misdemeanours by failing to grant them a child, or at least one that survives for more than a few days. (Three pregnancies have ended in tragedy, a source of much sadness particularly for Oyone as she feels the burden of guilt very deeply.) As a consequence of all this, Sösuke and Oyone have cut themselves off from the wider society, avoiding all unnecessary contact with others wherever possible. Much of the tension in The Gate centres on a problem relating to the support and education of Sösuke’s younger brother, the rather selfish and impatient Koroku. When Sösuke’s father died some years earlier, he left a house along with significant debts. Not having the mental resources to deal with the situation at the time, Sösuke handed the estate over to his uncle to sort out on the understanding that part of the legacy was to go towards funding Koroku’s school fees. Now the uncle has also died leaving the issue of what, if any, funds are due to Sösuke completely unresolved. What’s more, Sösuke’s aunt claims that she is no longer in a position to be able to continue with the payments for Koroku’s education as the money previously provided by Sösuke has run out – the implication being that Sösuke should step in and assume responsibility for Koroku’s school fees. Needless to say, this is an expense that he and Oyone simply cannot afford. As Sösuke wrestles with this problem, we sense his unwillingness to tackle the issue head on. Rather, he gravitates towards a position of inaction, preferring instead to put off any possible discussion with his aunt for fear of sparking a conflict. Sösuke’s reluctance to resolve this matter proves to be a constant source of frustration to Koroku, a feeling that only continues to burrow away as the weeks and months slip by. In particular, Koroku finds it annoying to see his brother lazing around doing nothing on a Sunday afternoon when instead he could be off visiting his aunt with the aim of resolving the question of funding once and for all. This element of the story also enables Söseki to draw the comparison between the old Japan (as represented by the quiet, traditional and unassuming Sösuke) and the new, emerging economy (typified by Sösuke’s cousin, the bright, dynamic and enterprising Yasunosuke). The cruelty of fate is a running theme here. At one point, a chance conversation between Sösuke and his kindly landlord threatens to cleave open old wounds from the past, a development which prompts Sösuke to seek spiritual enlightenment in an attempt to ease his anxiety. For all its quietness and sense of understatement, The Gate is a very powerful novel. There is a feeling of tension and pain running through the narrative, of things unsaid or pushed to one side. Nevertheless, despite all their troubles, Sösuke and Oyone love one another very deeply; they share a warm intimacy, taking comfort and strength from one another in their simple surroundings. While they hold out little hope for a brighter future, at least they have each other. In spite of its beautifully melancholy tone, the novel ends with the arrival of spring and signs of better days ahead for this couple. Nevertheless, Sösuke knows that everything in life in cyclical, and before long it will be winter again – what goes around comes around. Seamus at Vapour Trails has written a great review of this one, which you can read here. Emma has been reading Söseki’s I Am a Cat – I’ll add a link once her billet is available. Update: You can read Emma’s fascinating review here – do take a look. The Gate is published by NYRB Classics; personal copy. This entry was posted in Book Reviews, Söseki Natsume and tagged #TranslationThurs, Book Review, Classics Club, Fiction, Japan, Literature in Translation, Natsume Söseki, NYRB Classics, William F. Sibley on November 29, 2016 by JacquiWine.